Due date: Sun, Apr 16, 2013 (before midnight). In this assignment you will implement a 2D rigid-body system with broad and narrow phase collision detection and velocity-level contact resolution based on a projected Gauss-Seidel complementarity constraint solver. The starter code provides you with a simple frictionless penalty-force simulator, and allows you to draw simulation scenarios and input them into your simulator as images. You will test the scalability of your simulator on various image-based simulation scenarios, such as towers of stacked rigid blocks. Groups: Work on your own, or in a group of two people. Starter Code (cs5643.rigidbody): This project has significant starter code, primarily to support rigid-body dynamics, all-pairs penalty-based contact, image-based scene construction, and OpenGL rendering. It is available via CMS. In this assignment, you will modify this package as needed. Feel free to borrow code from your previous assignments, but all code used should be your own. 'r' : Resets simulations, and pauses it. 'w' : Toggles anti-aliased wireframe rendering. 'b' : Toggles rendering of simulated contact bounds geometry---each Block is bounded by a disk. 'l' : Toggles between single-step and multi-step Euler integration per frame. 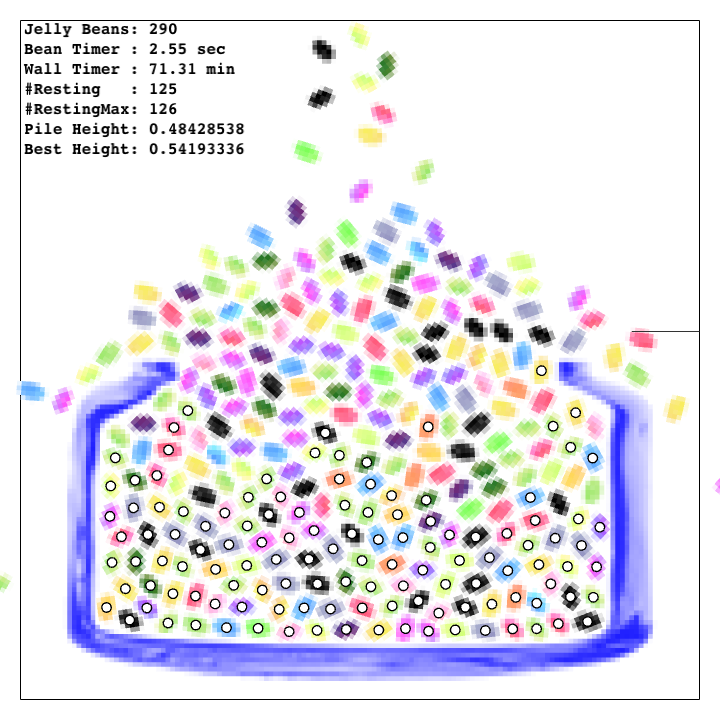 'j' : Jiggle--applies random accelerations to objects. 'e' : Toggles png-frame exporting to the "frames" directory. Test Images: I've included a number of helpful test images (see below). 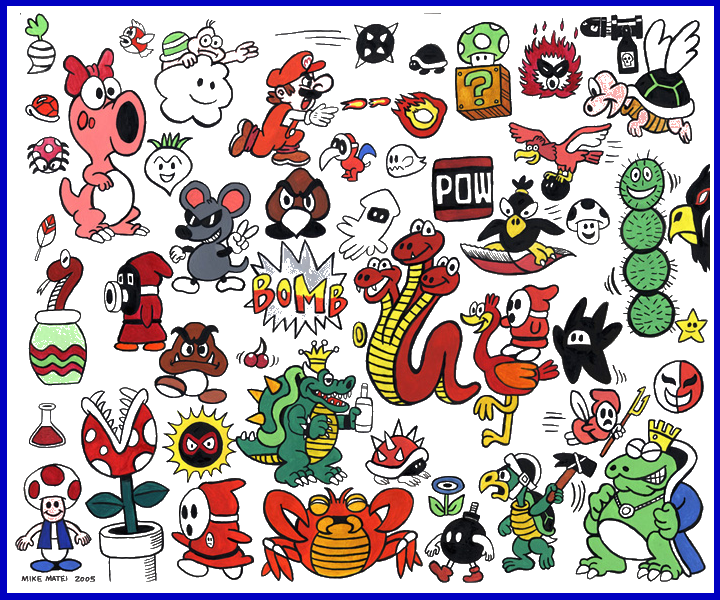 These are uncompressed TGA images, with empty space specified by white (255,255,255) colors. The intensity of the color specifies the mass density. Blue objects are pinned. 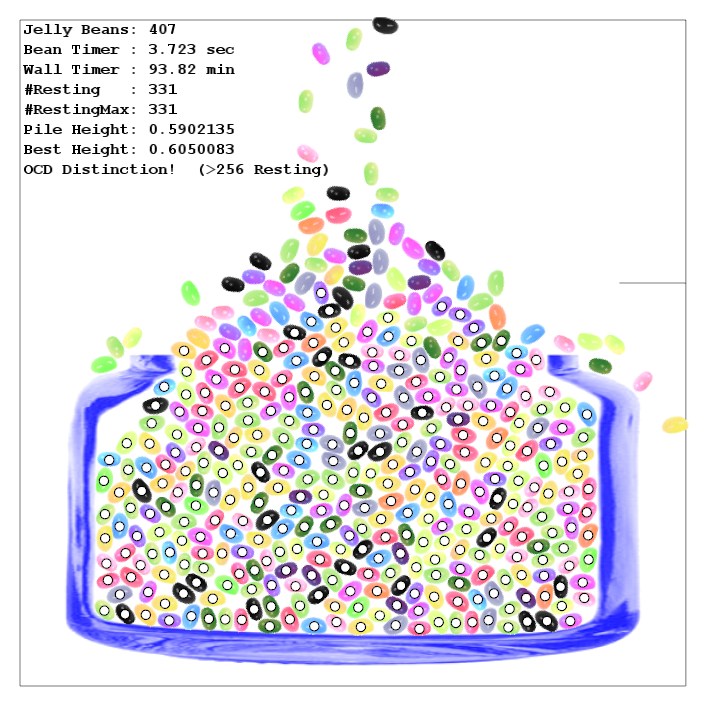 Feel free to draw your own elaborate simulations, and submit them to us for others to try. Penalty contact between two Block objects is currently implemented for you using a simple damped spring. Familiarize yourself with how contact is handled, and how the narrow and broad phase detection decides which Block-Block pairs to apply forces to. Notice that for difficult scenarios, the contact stiffness must be high, and the time-step size much be small, yet your objects might still interpenetrate especially with high rotational velocities. You will also use the simple Block bounding disks for a robust disk-disk contact model in your velocity-level integrator. Software Dependencies: As before, the starter code will compile and run using JDK 1.5 or later. I recommend you get Sun's latest JDK here. In addition to Java the starter code also uses JOGL/OpenGL and Vecmath familiar from previous assignments. Although you're welcome to modify the OpenGL portion of the assignment, it is not necessary to complete it. Performance Profiling: In addition to timing your broad and narrow phase collision times, you can use the "java -Xprof ..." option to help identify and remove program bottlenecks. You should also use the JVM's -server option to encourage aggressive runtime optimizations. 2. 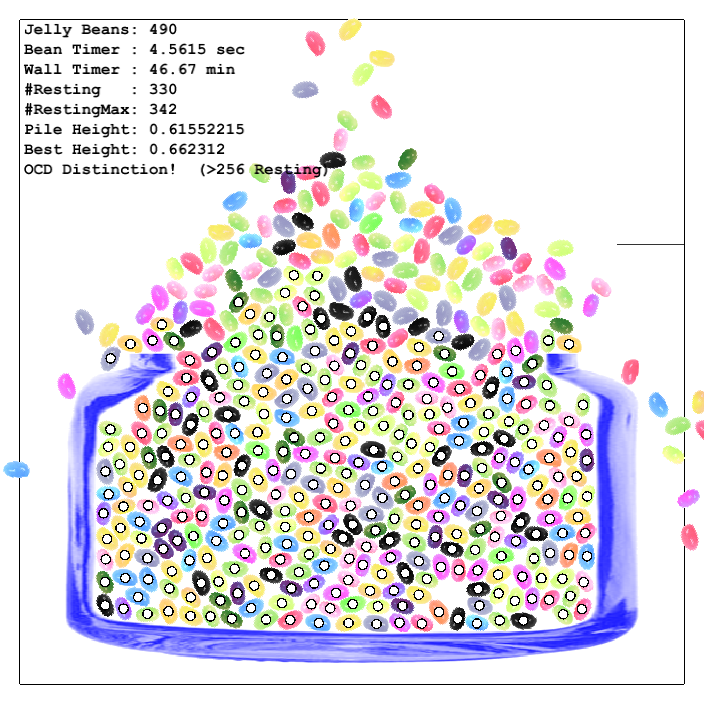 Narrow phase collision detection: Even with only a couple letters, e.g., web.tga, collision processing is slow due to both the small time-steps used and the naive all-pairs collision processing, i.e., each boundary Block on object "i" is tested against every boundary Block on object "j" for overlap of their bounding disks. Your first step is to acclerate object-object collision detection of overlapping Block/Disk primitives, and thus speed up the penalty-based simulator. You could do this in various ways. First, you could build a bounding volume hierarchy on each RigidBody's Block primitives, with the most natural hierarchy for Block primitives being one with axis-aligned bounding boxes (an AABB tree). Be careful that the bounds contain the support of any disk-like penalty forces, etc. Build the narrow phase data structure in each object's RigidBody constructor. Improve mouse picking and dragging: Use your narrow phase test to improve the mouse picking to select a (nearby) point on the object rather than just its center of mass. You can do this by implementing a better RigidBody.intersectsW(Point2d) method to see if a point intersects a rigid body's blocks, then modifying the mouse spring force interaction appropriately. Support object-object overlap queries to identify the overlapping Block disks for object-object pairs. This involves recursively testing one object's AABB-Tree against another object's tree. 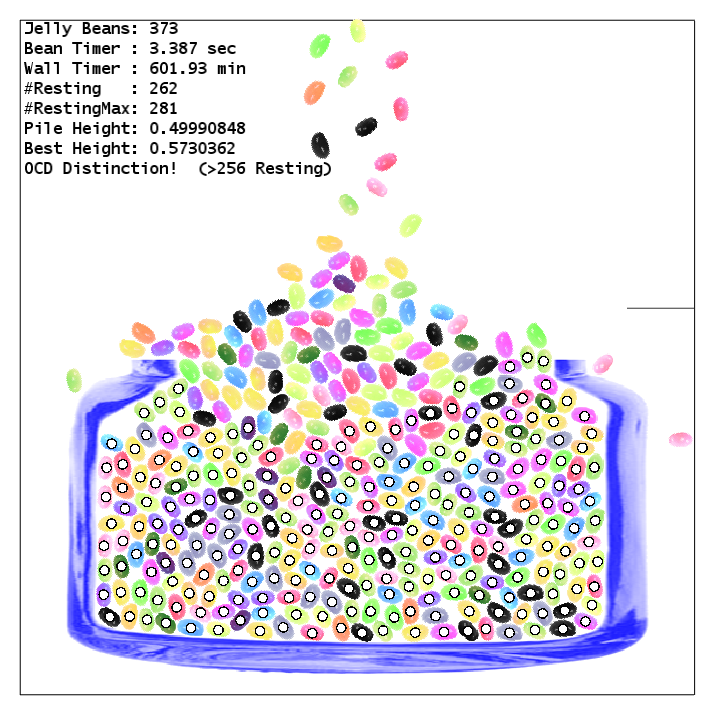 Your penalty-based simulator should now be much faster, and support much more complex scenes. Contact detection: Use the simple disk-disk contact geometry from the penalty-based solver to generate your velocity-level contacts. Given two overlapping disks and the line segment connecting their center points, use the line's mispoint as the collision point and its orientation as the contact normal. You will use discrete-time collision detection to find overlapping pairs (as opposed to continuous/interval-based collision detection like in assignment #2), which will work reasonably well for the disk-disk contacts and sufficiently small time-steps. Contact Jacobian: Given the contacts, you should implement basic functionality to evaluate the contact Jacobian to map between rigidbody velocity and normal/tangential contact velocity. Note that you need not explicitly compute a sparse matrix data structure and store the Jacobian. However, you will want to evaluate columns/rows, and know which contacts each rigidbody has, etc. Setting up w = A lambda + b: In preparation for projected Gauss-Seidel, you will need to compute the b vector of unconstrained contact velocities, and support evaluation of (block) rows of the A matrix. Exploit sparsity by using the fact that contact k is directly row-influenced by other contacts involving body i and j. Projected Gauss-Seidel (PGS) complementarity solver: Iteratively solve the complementarity problem by performing Gauss-Seidel iterations with appropriate clamping of the Lagrange multipliers. Use a fixed number of PGS iterations, such as 10 or 100 or 1000. At each iteration you will require a single row of the A matrix, however you will find it more convenient to evaluate/access both normal & tangential rows for contact k at the same time. Large numbers of iterations will benefit from efficient access and multiplication of the rows of A.
Pin constraints: Use inverse-mass-matrix filtering to support pinned rigid bodies (RigidBody.isPinned()), by treating pinned objects as having infinite linear and rotational mass. Observe that these filters will essentially zero-out certain contributions to the A matrix---notably its diagonal entries. 4. Challenge #1: "Stacks and other structures" Large stacks of objects and other statically stable structures can be a challenge for the PGS solver, and therefore make interesting test cases. I have made a number of these test cases for you. Good friction forces are particularly important given that contact geometry is modeled using disk-disk contact. Include videos of your most realistic stacking scenarios as indicated by "YES" in the "Include Video" column. Letters with fixed ground plane. A delicate structure. Use friction to keep him steady or he'll do the mambo. A "Laurel & Hardy" seesaw example. Watch out for interpenetration. The largest tower---100 bricks. Keep it steady, and watch out for interpenetration. You will need a lot of iterations for this example. Shock propagation is helpful. Try knocking it down once it's stable to make sure it's not just glued in place. Sparsely stacked wall with reducible A matrix. Sparsely stacked wall with reducible A matrix. The largest example. 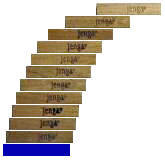 Densely stacked wall with irreducible A matrix. Densely stacked wall with irreducible A matrix. The largest example. Nasty case for broad and narrow phase collision detection due to one huge object containing many other objects. 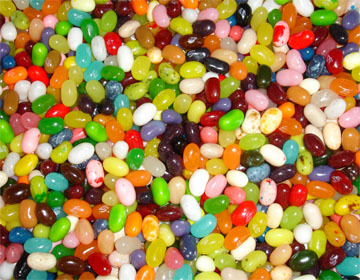 The "Jelly Bean Factory" will start automatically. 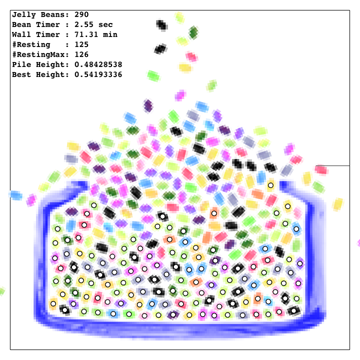 Use the low resolution images (quarter or half) for practice before tackling the full-resolution contest image (jellyBeanFactory.tga). 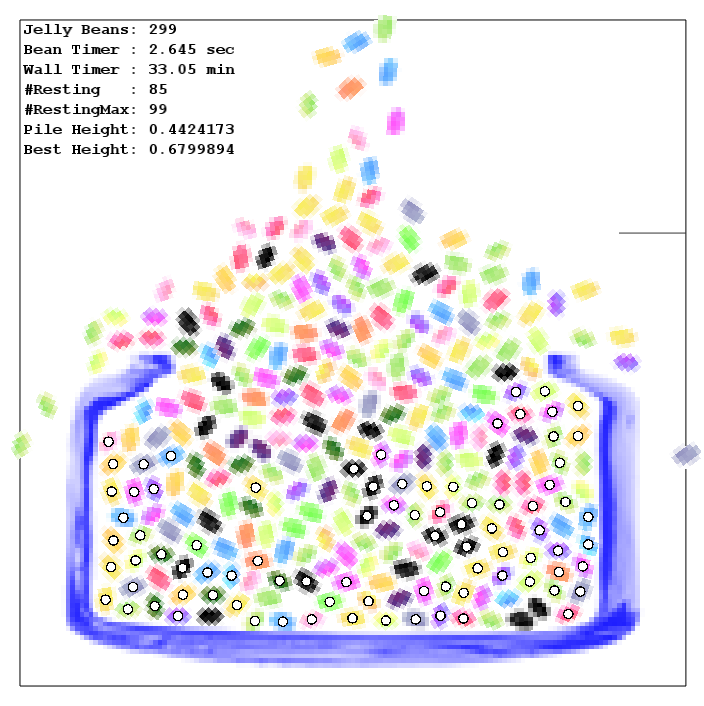 The goal of the contest is to fill up the jelly bean as much as you can, which means using friction to help you heap the beans into a big cone-shaped pile. Don't worry if some slide off the sides. 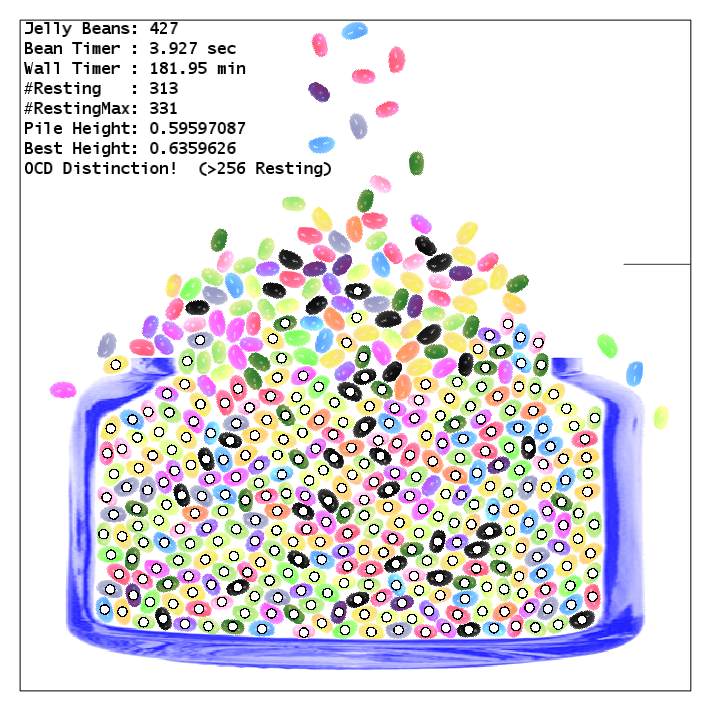 Keep the beans from interpenetrating too much, or it won't look realistic---not to mention that the disk-disk contact model will start to break down and generate bad normals. "Room for resting beans only, please. 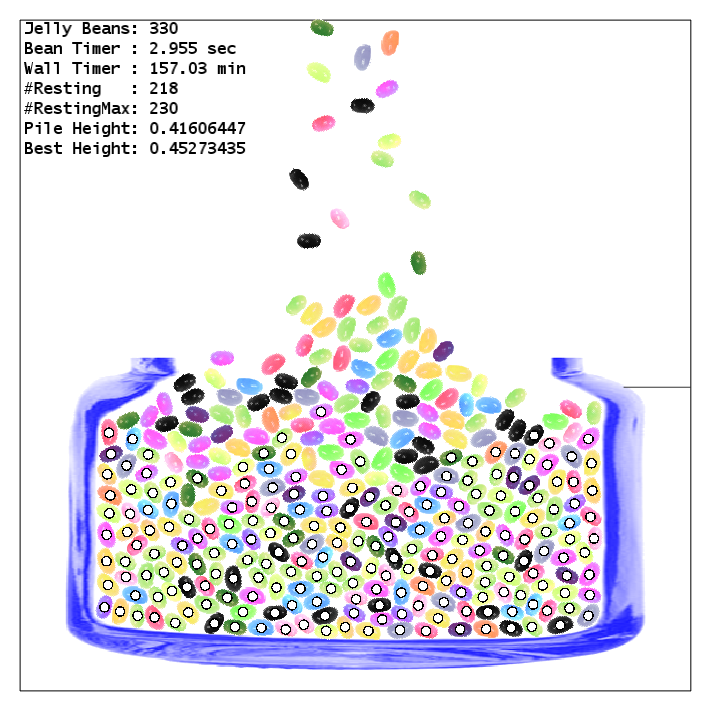 ": To make it extra challenging, your friction forces need to keep as many of your beans from moving as possible. That means no implausibly sliding, jittering, or chattering beans---these aren't coffee beans! 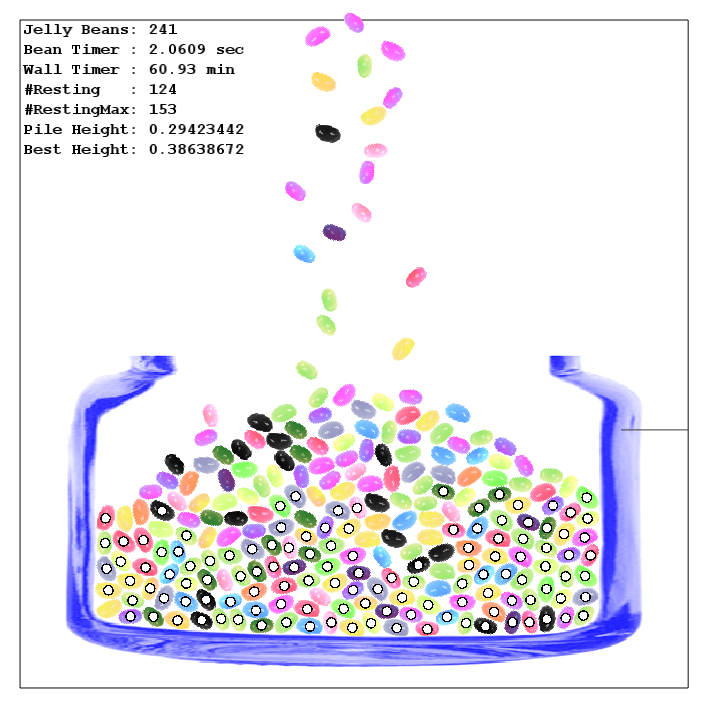 The simulator will track how many beans are resting at any time (nResting), and the historical maximum (nRestingMax). 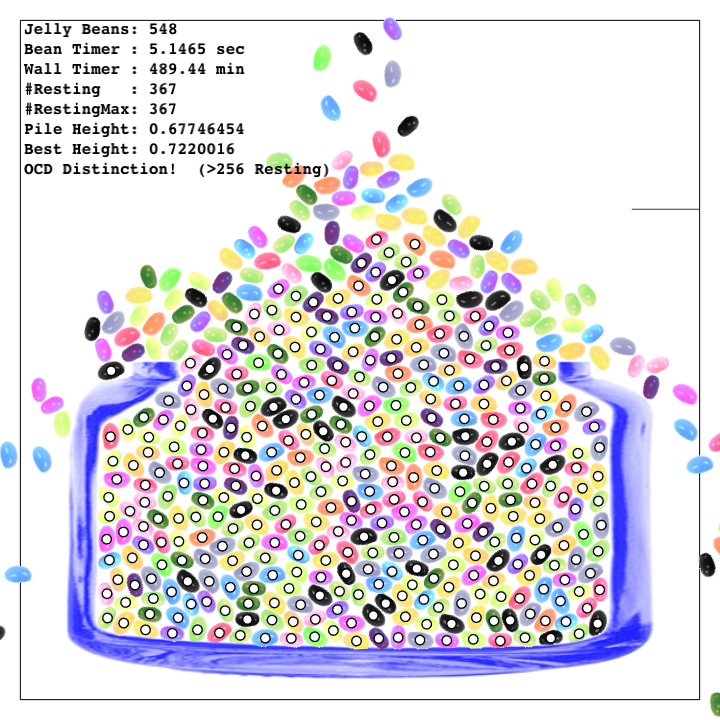 It will also estimate a not-so-robust height of your resting jelly bean pile (Pile Height) and its historical maximum (Best Height). Good luck! 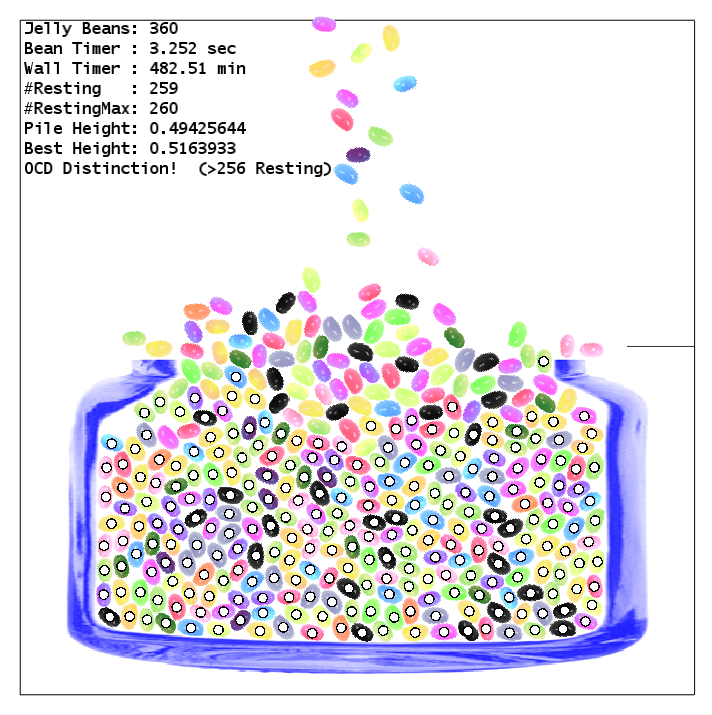 No cheating: Do not modify the Jelly Bean Factory code, or your contest submission will be void. Also, you are not allowed to simply set the velocity of beans to zero (which will void your submission). You must rely on the same general-purpose projected Gauss-Seidel (or better) complementarity-based velocity-level contact solver used in all examples. 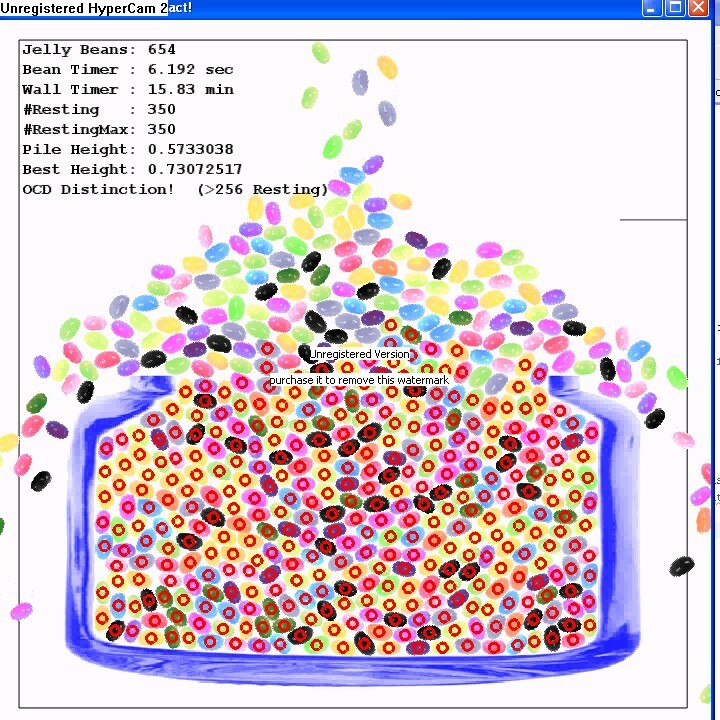 Broad phase collision detection: Once you have an efficient narrow phase processing and the velocity-level constraint solver working, you can collide detailed objects together efficiently and your bottleneck will shift to the all-pairs broad phase test for certain scenarios. 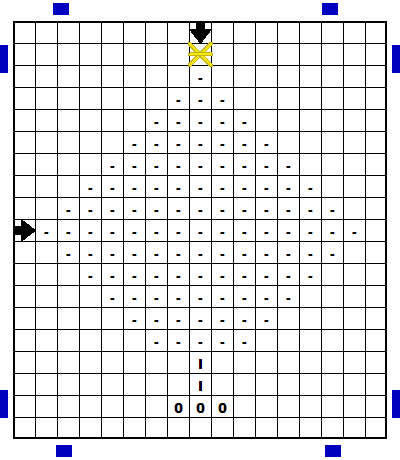 You can implement any broad phase collision detection scheme provided it yields decent performance on the large examples. Schemes you might consider are uniform spatial subdivision and related hashing schemes, hierarchical grids (better performance on variable object sizes), octrees, kd-trees, as well as sweep and prune. Feel free to use your own code from the second (Spaghetti Factory) assignment. Adaptive Time Stepping: Given that contacts are detected using discrete collision tests, you may want to monitor the maximum Block speed to reduce the time-step size to avoid missing collisions. 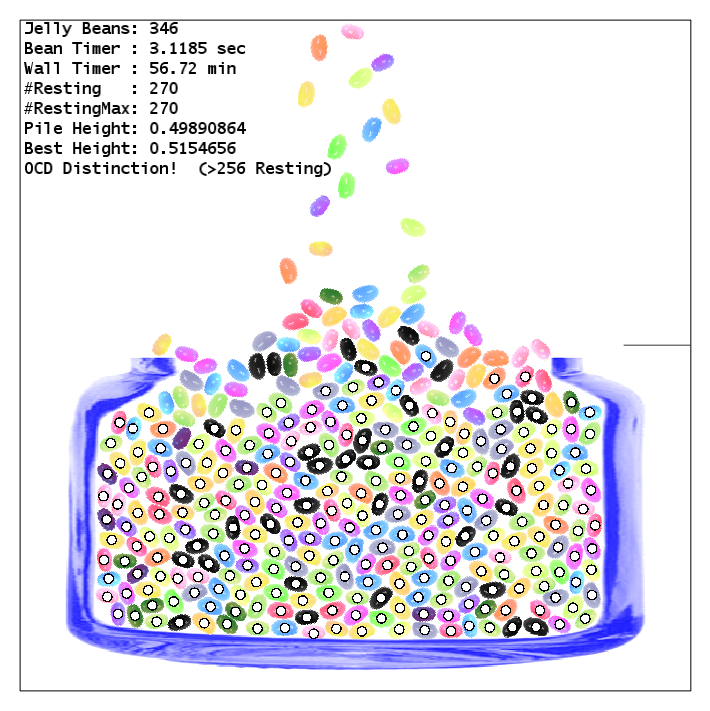 Continuous Collision Detection: High speed motion can lead to missed collisions or deep interpenetration when using the discrete collision checks. Implementing a continuous sphere-sphere check (using a quadratic-root finder and range check) can help you find those high-speed collisions and obtain better contact normals. Of course you still want to be able to handle interpenetration robustly. Exploiting temporal coherence: In addition to adaptive time-stepping, you can exploit temporal coherence by reusing previous values from your PGS solve to "warm start" solutions at the next time step. This is particularly useful for quasi-static examples, such as stacks, but it can also be useful for less contrived examples. One challenge is establishing contact-contact correspondence between time steps. Restitution coefficient: The contact conditions derived in class impose a nonnegative normal velocity at contacts, however for new impacting contacts you may wish to impose an impact condition on the normal velocity based on a restitution model. Note that this only involves modifying the right-hand side "b" of the linear system used for the contact conditions (see equation 22 of [Erleben 2007]). "Shock Propagation": Stacking examples are particularly challenging for PGS, and shock propagation techniques are commonly used to accelerate convergence or provide more plausible approximate solutions [Erleben 2007]. Try building a contact graph and using shock propagation to improve the stability of your stacks, and achieve that extra special OCD distinction. Other optimizations: Erleben mentions various enhancements to improve the performance of the PGS solver. Feel free to incorporate these into your submission. Other forces: Feel free to add springs, joint constraints or other rigid body system elements to allow you to model more interesting mechanisms. Mass-Splitting Jacobi: Swap out the Gauss-Seidel solver, and try the new modified Mass-Splitting Jacobi iteration of [Tonge et al. 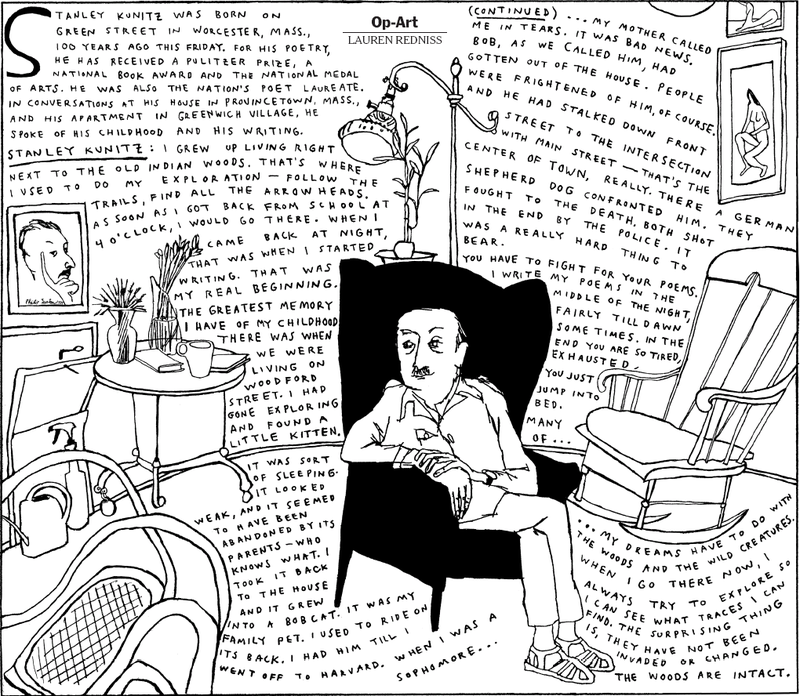 2013]. It may produce better results in some scenarios, especially if you do not use shock propagation. Hand-in using CMS: Please submit a brief written report (in txt or PDF format) describing your approach and any findings, in addition to your Java implementation. 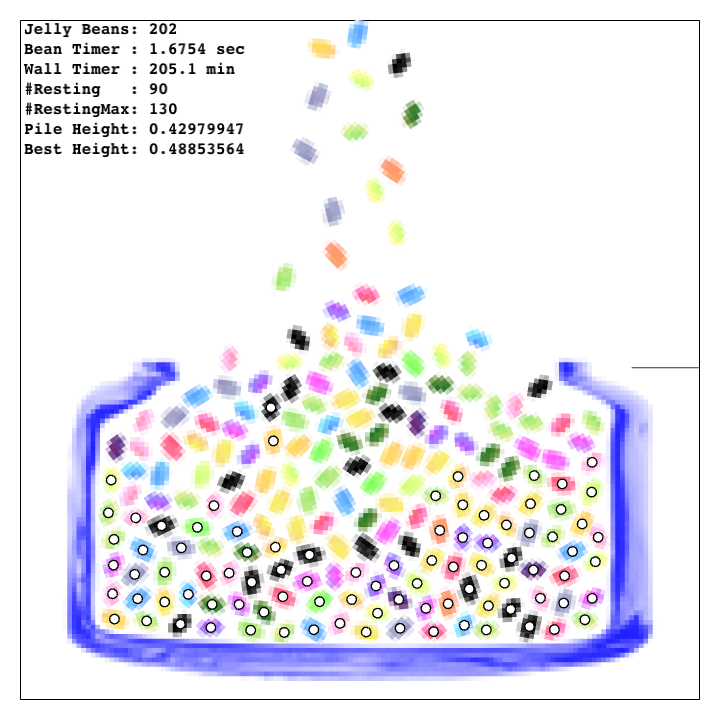 Provide videos to document any results you want us to see, any creative artifacts, and your best Jelly Bean Factory run, and your best stacking example runs. If you are working with a partner, be sure to form and submit your zip file as a group. Submit videos in a portable format such as QuickTime, mpg, or divx, but not native formats, e.g., not the FRAPS codec for your machine. Please submit videos with a fixed resolution of 720-by-720 (the default resolution). On collaboration and academic integrity: You are allowed to collaborate on the assignments to the extent of formulating ideas as a group, and derivation of physical equations. However, you must conduct your programming and write up completely on your own (or with your partner), and understand what you are writing. You may not use code from the web. Please also list the names of everyone that you discussed the assignment with. You are expected to maintain the utmost level of academic integrity in the course. Any violation of the code of academic integrity will be penalized severely. K. Erleben, Velocity-based shock propagation for multibody dynamics animation, ACM Trans. Graph. 26, 2, Jun. 2007. Witkin, A., and Baraff, D., Eds. 2001. Physically Based Modeling: Principles and Practice. Course Notes. ACM SIGGRAPH '01. Eran Guendelman, Robert Bridson, Ronald P. Fedkiw, Nonconvex Rigid Bodies With Stacking, ACM Transactions on Graphics, 22(3), July 2003, pp. 871-878. Richard Tonge, Feodor Benevolenski, and Andrey Voroshilov, Mass Splitting for Jitter-Free Parallel Rigid Body Simulation, ACM Transactions on Graphics, 31(4), 2012. M.C. Lin and S. Gottschalk, Collision detection between geometric models: A survey, In Proc. of IMA Conference on Mathematics of Surfaces, 1998. P. Jimenez, F. Thomas and C. Torras, 3D collision detection: A survey, Computers & Graphics, 25(2), 269--285, 2001. Philip M. Hubbard, Approximating Polyhedra with Spheres for Time-Critical Collision Detection, ACM Transactions on Graphics, 15(3), July 1996, pp. 179-210. Gino van den Bergen, Efficient Collision Detection of Complex Deformable Models using AABB Trees, Journal of Graphics Tools: JGT, 2(4), 1--14, 1997. For rigid bodies there is no need to update the bounding volume hierarchy every frame, unlike with the deformable model case in [van den Bergen 1997]. Although the bounds are axis-aligned in each object's material frame, when testing two objects' AABB-rees against each other, bounds are rotated due to the relative rigid transformation between the two objects. J.T. Klosowski, M. Held, J.S.B. Mitchell, H. Sowizral and K. Zikan, Efficient collision detection using bounding volume hierarchies of k-DOPs, IEEE transactions on Visualization and Computer Graphics, 4(1), 21--36, 1998. Gottschalk, S., Lin, M. C., and Manocha, D. 1996. OBB-Tree: A hierarchical structure for rapid interference detection. In Proceedings of the 23rd Annual Conference on Computer Graphics and interactive Techniques SIGGRAPH '96. ACM, New York, NY, 171-180. Copyright Doug James, March 2013.